Successfully Added USB Cassette Player and Tape-to-MP3 Converter (Plug and Play) to your Shopping Cart. Turn all your old school cassette tapes into digital MP3 files through this cool and handy gadget. Then, listen to them on your computer, iPod, or MP3 player! Finally you can back up your graduation album, 80s mix tapes, or precious old music recordings of a friend. 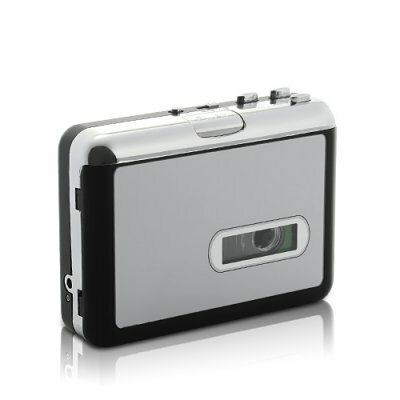 This USB cassette player is easy to use and the software can be installed in just a few seconds. Simply plug the Cassette Player in to your computer, press play, and it will start recording everything onto your desktop. In addition, the Cassette Player is powered directly from the USB so there’s no need to worry about the battery or bringing along cables when your friend wants to use it. Apart from converting your tapes into digital files, it itself is also standalone cassette player which you can enjoy hours of music with. If you are looking for a cheap and easy way to turn your cassette tapes into MP3 files, this is the perfect product for you. Just Google “Tape-to-MP3 Converter” and see how similar products are selling at 3 times our wholesale price. Buy your sample today and it gets shipped within one day. Brought to you by your source for cool electronics, Chinavasion. No, it does not come with speakers, but you can listen to music with the included free earphones.